Every year the large retirement center in our town hosts a patio sale to raise funds for their Benevolent Fund. Items are donated and curated from residents and their families and I’ve never walked away without a handful of treasures. Pause, who am I kidding, handfuls? More like, bag fulls! Two summers ago we went with the intention to purchase spare bedding and 4,000 towels in preparation for our home birth kit. We walked away with 2 sets of king sheets, various other home birth supplies (like a metal bowl to catch the placenta!) and probably 20+ towels all in the name of our home birth. Best of all, $50. That’s it. The sale is meticulously organized by categories – knitting needles with knitting needles, sheets are folded and labeled with dimensions, books are divided by genre. It’s amazing! Everything is priced reasonably and needless to say, mountains of treasures are just waiting to be found. We arrived at 9am with a rush of other treasure hunters. I had a specific list this year – a queen duvet filler for our guest room, hopes of fulfilling this pinspiration, milk glass and all the hangars for all the pictures! I walked away successful. Seriously, everything on my list AND MORE. In addition to my hoped for items I found fabric to recover some pillows, CDs for Jem’s bedtime music (Swan Lake and the Nutcracker – both of which she adores), yarn for rustic present ribbon, cloth napkins, a few books and two soap dishes (shown above). Oh, and two silk scarves that are just perfect for summer headbands! 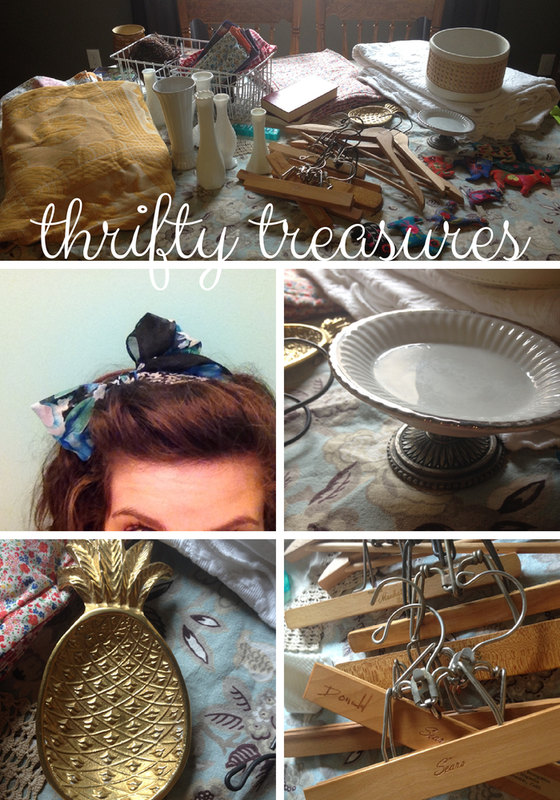 Thrifters – it’s worth feeling a little envious, this sale is the bee’s knees! Next year I’ll have to take some photos of the actual set up. It’s truly amazing all the time and energy the sweet retired gals put into prepping for this sale! What has been you favorite thrift find lately? Wow! I am not having any sort of luck around here, so *tinge* of jealousy… also, can't wait to see the picture hangers in action!